This is an absolutely incredible price on the LA Kings tonight. The Kings are 16-6-3 overall (8-3-1 Away) and the Sharks are 15-3-5 (7-1-2 Home). The LA Kings defense has been stunning as of late. Quick is still out with his groin injury (back late next month) and Ben Scrivens hasn’t had a problem holding down the fort in his absence. Scrivens has the BEST goals against average (1.43 GAA) and the BEST save percentage (.947 SV%) out of all the goaltenders in the NHL. Not only does he have the best GAA and save percentage, but he also leads the league in Shutouts with 3 shutouts. He is truly a remarkable goaltender and has allowed only 9 goals in 7 games (average of 1.29 goals against per game) since Quick left with his groin injury. Ben Scrivens has allowed more than 2 goals in the same game only once ,against Phoenix. In all of his other games he has allowed 2 goals or less, and 0 goals 3 times. The Kings haven’t been scoring many goals this season 2.52 goals per game (20th overall) but they more than make up for it with their defensive numbers. In their last 10 games, the Kings have allowed only 1.20 goals against per game, and have scored 2.40 goals per game. The Sharks have allowed 2.50 goals against in their last 10 and have scored 2.80 goals per game. Also note that the Kings have won each of their last 4 games on the road, which included 2 shut-outs in 2 of those 4 games. The Kings are a great defensive team and although the Sharks score more goals they will definitely have their work cut out for them tonight. The Kings have a far greater shot at winning this game than this price indicates, so we will gladly back the Kings tonight for a great price of 2.50. The Tampa Bay Lightning are excellent at scoring goals at Home. When the Lightning play at home, they manage to score 4.18 goals per game, and allow 2.36 goals against when playing at Home. Overall, the Bolts score 2.88 goals per game and allow 2.54 goals against. The Philadelphia Flyers score 2.17 goals per game overall, but over their last 10 games they have managed 2.90 goals per game. The Flyers need to play more disciplined hockey, as they take 16.8 penalty minutes per game. The Flyers have a 81.7 PK% overall, but note that when playing away they have a 79.1 PK%. The Lightning have a 17.2 PP% overall (19th) but when playing at Home they score on 22.7 % of their power play attempts, and the Flyers have a 22.9 PP% when playing Away. The Lightning’s goals are down to 2.40 goals per game over their last 10, but they have faced tough opponents like San Jose, Phoenix, LA, Anaheim to name a few. The Lightning recently snapped a 4 game losing streak against New York on Monday wh ere they scored 5 goals in a 5-0 victory. Vincent Lecavalier will face his former team tonight after 14 season with the Tampa Bay Lightning. He has 8 goals and 5 assists for 13 points and will look to score on his former team tonight. We know the Lightning can score 4+ goals per game at home and we will look for them to keep lighting the lamp at home tonight to send this one OVER 5.5 goals for a great price. Click Here to Purchase Our Premium Picks Season Pass! 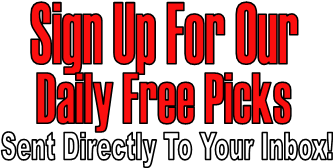 INSTANTLY Receive tonight’s pick and all of our picks all season long!